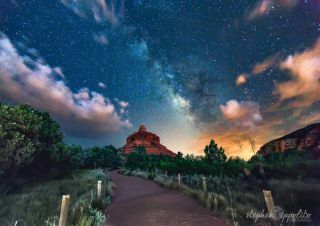 Stephen Ippolito took this image from Bell Rock in Sedona, Arizona on August 9th. A lightning storm illuminated the Arizona sky in this stunning skywatcher image of the Milky Way. Photographer Stephen Ippolito took this image from Bell Rock in Sedona, Arizona on Aug. 9. "I received a lot of help from mother nature for this image," he told Space.com in an email. "As you can see, Bell Rock is illuminated. It is illuminated because there was a massive lightning storm many miles behind me that was illuminating the entire sky, and when the lightning struck, the entire Bell Rock area would be illuminated." The Milky Way galaxy is a barred spiral galaxy with roughly 400 billion stars, including our sun. The stars, along with gas and dust, appear like a band of light in the sky from Earth. The galaxy stretches between 100,000 to 120,000 light-years in diameter. At the center of our galaxy lies a gigantic black hole billions of times the size of the sun. Editor's note: If you have an amazing night sky photo you'd like to share for a possible story or image gallery, please contact SPACE.com Managing Editor Tariq Malik at spacephotos@space.com.